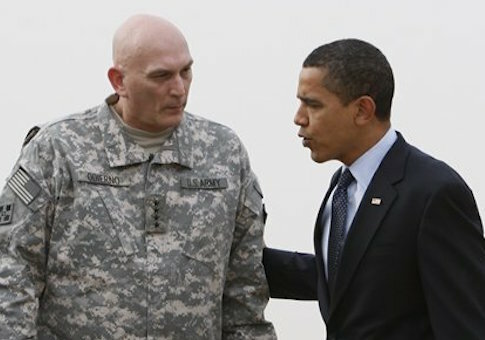 Weeks away from retirement, Army Chief of Staff Gen. Ray Odierno believes that the U.S. military could have thwarted the rise of the Islamic State (IS, also known as ISIS or ISIL) had the Obama administration left troops in Iraq beyond 2011. In an interview with Fox News Tuesday, the top Army officer, who has spent 39 years in the military and spent more time in Iraq than any other U.S. general, labeled the rise of IS "frustrating to watch," suggesting that it was a mistake for the United States to pull out of the region at the end of 2011. I go back to the work we did in 2007, 2008, 2009, and 2010 and we got it to a place that was really good," Odierno detailed. "Violence was low, the economy was growing, politics looked like it was heading in the right direction." If we had stayed a little more engaged, I think maybe it might have been prevented," he supposed, adding later that "it would have been good for us to stay" after the end of 2011. Though he had recommended in 2009 that the United States keep 30,000-35,000 troops in Iraq beyond 2011, his recommendation was rejected. Currently, the Islamic State is implementing traditional methods of governance in Iraq and Syria and showing signs of transformation into a functional state. Odierno also expressed concern about the cuts the U.S. military has endured since 2010, particularly those that will reduce the number of troops by 40,000 over the next two years. The top officer said that the 14 percent reduction in U.S. troops — which shrank the number of soldiers from 570,000 to 490,000 — that the Army has seen since 2010 renders the United States unable to "deter conflict and prevent wars." "In my mind, we don’t have the ability to deter," Odierno explained. "The reason we have a military is to deter conflict and prevent wars. And if people believe we are not big enough to respond, they miscalculate." Furthermore, he contended that the Obama administration’s move to cut the Army by 40,000 additional troops over the next two years will prompt our enemies to "question" the United States’ ability to respond to conflict. As a result, U.S. adversaries could "take maybe a bit more risk than they might have just a few years ago." "Two years ago, we didn’t think we had a problem in Europe. … [Now] Russia is reasserting themselves. We didn’t think we’d have a problem again in Iraq and ISIS has emerged," Odierno elaborated. "So, with Russia becoming more of a threat, with ISIS becoming more of a threat, in my mind, we are on a dangerous balancing act right now with capability." This entry was posted in National Security and tagged Army, Barack Obama, Department of Defense, Military, Terrorism. Bookmark the permalink.